“Your Imperial Majesty and Your Lordships demand a simple answer. Here it is, plain and unvarnished. Unless I am convicted [convinced] of error by the testimony of Scripture or (since I put no trust in the unsupported authority of Pope or councils, since it is plain that they have often erred and often contradicted themselves) by manifest reasoning, I stand convicted [convinced] by the Scriptures to which I have appealed, and my conscience is taken captive by God's word, I cannot and will not recant anything, for to act against our conscience is neither safe for us, nor open to us. "On this I take my stand. I can do no other. God help me. Amen." ~ Martin Luther at the Diet of Worms, April 17, 1521. 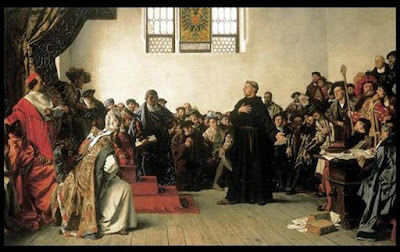 Martin Luther's nailing of the 95 Theses to the All Saints Church door at Wittenberg on October 31, 1517 has long been said to be the beginning of the Protestant Reformation. In honor of the Reformation, I think it is imperative that we take some time to reflect upon and honor Martin Luther's contribution to our Christian heritage. Martin Luther was born in 1483, the son of a poor woodcutter and miner. His parents (John and Margaret) named him Martin since he was born on November 10th, the eve of St. Martin’s Day. As soon as Martin was old enough, his parents desired to raise him up in the fear of the Lord and in the admonition of Christian virtue. This entailed beating him occasionally to the point of blood believing they were helping him, though later, we find this reflected in God as cruel and unloving to the cloister monk. His father had not been trained in school, and so desired this for his son, ultimately sending him off to become a lawyer. At school Martin met with flogging as at home, but he also met with learning. He was taught the Catechism, the Creed, the Ten Commandments, the Lord’s Prayer, hymns, and a Latin grammar. However, these did not help him to find the loving Christ, but seared the brand of a God of judgment upon his mind and heart. Since John Luther desired Martin to become a scholar, after his basic schooling he sent him to the Franciscan school at Magdeberg. He had to beg for his food, and sat timidly before his master-teachers each day for instruction. He was only fourteen years old. While Martin Luther's father wanted him to become a lawyer, Martin eventually left law school and entered the Augustinian Monastery in Erfurt to become a monk instead. One can certainly see the providential hand of God throughout this heroic man's life. As Luther entered the monastery there were adverse reactions from his friends and especially his father. His friends thought he was entering a “life” that was “partially dead” in its denial of so much, and that a genius such as Luther ought not to kill himself in this way so early on. His father was furious since he had spent so much hope on him having the schooling and making something of himself that he had not obtained in his own youth. The monks received him with joy, but they put him to work in order to humble him. He was tried in many small things, and was cast under a sever apprenticeship of monkery. He would fast, beg for money and food with his order, read the Word for days on end, and began to learn the original languages while here. He continued to study Augustine, Biel and Peter d’Ailly. His food consisted mostly of herring and bread, and became one of the most dedicated and “pious monks” of Rome. He was reminded by the monks to work righteously before God. But what righteous acts would his sinful heart offer up to God to be accepted? In response, he became dejected to the point that the other monks disliked his company. Luther’s “tender conscience” regarded the “slightest fault as a great sin.” The music of his friends sometimes pulled him slowly out of his depressed fits, but it was not enough to clear his conscience completely from the faults he saw looming over him and before the face of God. We are told in chapter five that when Martin Luther was sent to the University of Wittenberg, "it ultimately was the breeding ground for the Reformation through Luther’s preaching, teaching and writing." And it eventually led to his nailing the Ninety-Five Theses to the church door and the subsequent confrontation with the Catholic Church over the sale of indulgences. The story of Martin Luther's conversion to Christ is fascinating and his boldness in confronting the error of his day can only be attributed to the Holy Spirit of God. During this season of celebrating and remembering the Reformation, I pray you'll be blessed by learning more about Martin Luther and the Mighty God he served.